The El Primero in the pic is a Zenith A. Cairelli Chronograph CP-2, for the Italian army. From almost the very beginning of my journey into this hobby - and by that l mean from the point when l began to understand it beyond drooling at goldsmiths window - l have had a massive respect and admiration for Charles Vermot. His refusal to accept the "inevitability" of the changes in the technology of the day and his belief in the value of mechanical beauty and relevance in watchmaking is something genuinely special. Some very interesting reading in those links, thanks for sharing. 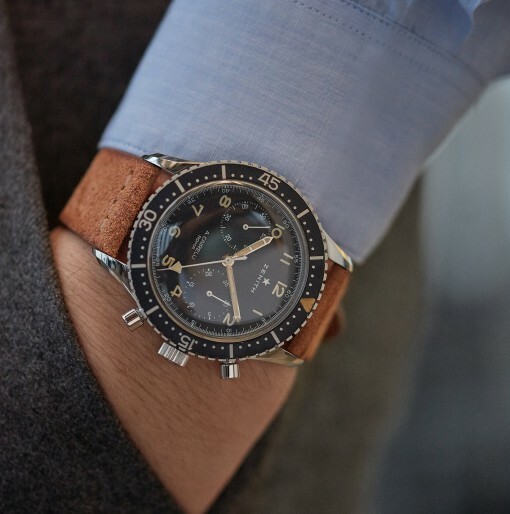 Some very good stuff there, but your pic is not an El Primero, the original Cairelli pre-dates the El Primero and uses a manual wind Cal 146 (HP or DP, not sure) - but one that came from UG, rather than in house. Very cool read. Thanks for sharing. Of course, the reason the original CP2 didn’t feature the El Primero movement was because, in the mid-sixties, it didn’t exist. It only arrived several years later (1969). But as the one truly iconic Zenith movement, it seems fitting that it features in the 2016 re-edition of the CP2. Both watch and movement mark significant Zenith achievements. Trouble is, the market has become so conservative that anything that isn’t a sports Rolex is automatically handicapped. Thanks for that. At least the reissue is an El Primero. It is indeed, which is the reason for the only visible design change (between original and the re-issue) in the dial, the fact that the re-issue sub-dials finish incredibly close to the centre pinion, which they do not on the original. This is because the El Primero sub-dial centres are closer to the central pinion, and to keep the proportions on the outside, the other edge has to head towards the centre. Thanks for posting this, very interesting. I'll wear mine with a renewed pleasure. Great read, thanks. I'd heard this story alluded to on Podcasts, but hadn't read it in detail. As for Rolex, some can't even keep it out of discussion even when talk is about a Zenith movement. Rolex must haunt them in their sleeps too. Unhealthy obsession.